That was some smoke signal! No kidding. I’ve always thought of smoke signals as puffy, small, and well-contained: probably thanks to early Westerns and some overly-romantic writing about life on the frontier. It seems fires often were more expansive, and that Native Americans used some of the same techniques we do to limit the spread of their fires: back-burning and such. Yes, they used fire a lot, although not much in forested areas. They knew how to handle fire and had good reasons to use it. Even now there are lots of Indian “Hot Shot” crews fighting fires. I wonder how far Lewis and Clark’s fire spread. It could have become quite a conflagration. And in this case, there was no need for fire as a means of communication. https://www.futilitycloset.com/2017/08/04/united-nations-5/ Have you come across this incident in the journals? I expect you know it well. This is all new to me but it seems that Sacagawea is almost as famous as Lewis and Clark. I read the Unite Nations post this morning, and this evening I am reading your post on Lewis and Clark. I am captivated by these stories. Thank you. You’re welcome. As Sacagawea was a captive of the Hidatsa, you were a captive of her story. That is a good account. Thanks for adding it. I hadn’t known about Futility Closet, but who wouldn’t like a site with a name — and contents — like that? I’ve not found the incident in the journals yet, but I’ve known of Sacagawea and her role in the expedition as long as I can remember: certainly from grade school days. The fact that both a Lewis and Clark commemorative coin (Lewis on one side, Clark on the other) and a coin for Sacagawea were minted is interesting. The Lewis & Clark coin was produced for the Portland Exposition marking the centenary of the Expedition. It didn’t sell well, but it was the only U.S. coin that had a person on each side. Sacagawea’s coin was issued in 2000, and was much more popular. It was unusual, too, since she’s not shown in profile, but looks straight at the holder. My dad was a coin collector, and Mom always enjoyed the special issues, so I gave her one of the Sacagawea dollars as a stocking stuffer one Christmas. What a lovely gift. My mother loved special issue coins. I have some of her collection but I don’t think I ever gave her one. My mind is a buzz with all things I have learned today. OK. 7 Degrees of Kevin Bacon Time. The Sacagawea coin was sculpted by Glenna Goodacre using Randy’L He-dow Teton, a Shoshone woman from New Mexico as the model. (I love that her middle name “He-dow” means “meadowlark” in Shoshone). Goodacre is from my home town, and her daughter Jill (former supermodel and photographer) is married to Harry Connick, Jr. Periodic fires kept the prairie healthy, clearing the dense mats of dead grass to allow for new growth and fertilizing that new growth with the ashes. On the flat lands, the smoke from the fires can be seen for great distances and would be a perfect signal to call a far flung people together. You’re right about the distances. This fire was on the Tallgrass Prairie in Kansas, just north of Strong City, and I was about 20-25 miles SSE, on a gravel road east of Cassoday. It was unusual for them to be burning in the fall, but the conditions were just right, and I was lucky enough to catch one from a distance. I read Glenna Goodacre’s name in the article I linked for Gallivanta, but I hadn’t heard of her and read right past the name. When you mentioned her again, the first person I thought of was Veryl Goodnight, the sculptor who’s a descendent of Mary Ann Goodnight, and who specializes in Western art. (She also is the creator of “The Day The Wall Came Down, which I think you’ll appreciate.) There surely are a lot of “goods” up there in the Panhandle. I like the name “He-dow,” too. When I looked at an entry about the Shoshone peoples, I saw Randy’L He-dow Teton mentioned, as well as Chief Pocatello. I had no idea Pocatello, Idaho, is named after a Shoshone chief. There’s a lot about the West I don’t know. I’d hate to be the secretary that had to deliver that memo!! Isn’t that the truth? On the other hand, it seems such “memos” were sent only when important issues were at hand. No inboxes stuffed with advertising spam and bad jokes out there. When I look at the photo of this prairie fire, though, I do wonder: how did they know what message was being sent? There must be more information about that, but I haven’t yet found it. Now, that’s funny, GP. I wonder if there were occasions when both Indians and explorers set off for the same smoke plume, only to discover neither group had set it off? It’s fun to think about some of the complexities that might have arisen. Now that’s the biggest open ended message I’ve seen. Fabulous picture. It’s an interesting photo, and one I really like. I had no idea how difficult it could be to photograph smoke: at least, smoke that’s diffuse rather than a solid column, as in a forest fire. You’re right about the value of primary sources. It’s great that they’re becoming more available online. When I wrote about Monument Rocks, it took me forever to confirm that Henry and George Engelmann were brothers, but eventually I found the documentation — all online. The biggest problem is my propensity for link-hopping. Who needs social media for time-wasting when you’ve got JSTOR? Seriously! So much fascinating fun so available…time flies. This is why I admired the engineers’ concept for the Samsung Galaxy 7 – – the cellphone reception was not very good, but when the lithium battery spontaneously burst into flame, you could set the neighbors’ lawn on fire, and initiate a face-to-face conversation, like the good old days. I can’t tell you how I laughed at this. Your mind definitely achieves high-level quirkiness more than most, and this is flat funny. It’s especially funny because, around here, the only time all the neighbors in my apartment building gather is when one of the bored teenagers decides it’s time to pull the fire alarm again. It wouldn’t be so funny if there were real fire to deal with, but the face-to-face is nice, and as a bonus we get to look at the fire engine. I only wish British Columbia’s current fires were as controllable as those ones must have been. Your elegant photograph and interesting quote sure have set off a blaze of comments – as usual! From what I’ve read, fires did get out of control from time to time: both natural fires, and those that were set. I also was surprised to learn how well plains tribes could control the fires they set, although I shouldn’t have been. Fire was a tool for them, and one they wielded with some skill. One thing I learned while taking this photo is how quickly smoke can change, just like colors at sunrise or sunset. When I first noticed it, it was a more discrete plume stretching up into the sky. By the time I’d stopped the car and changed lenses, it already was thinning and spreading. But I still like the effect. Great photo, Linda. I’ll bet there must be some sort of regulation in place nowadays that prevents the lighting of such a blaze. Especially during drought season! There certainly are regulations for prescribed burning (that’s a prescribed burn in the photo), but I doubt that there’s a law that says, “Hey, folks. Don’t just light a fire because you want to chat!” After all, we have email, texts, and cell phones today. On the other hand, there still are plenty of fires that pop up from natural causes that can be just as dramatic. Lightning causes a lot of them. I’ve learned from people out west that thunderstorms can be a mixed blessing for people fighting fires. Yes, there’s rain, but just as often there can be lightning that sets off more fires. That would be a good example of adding insult to injury. 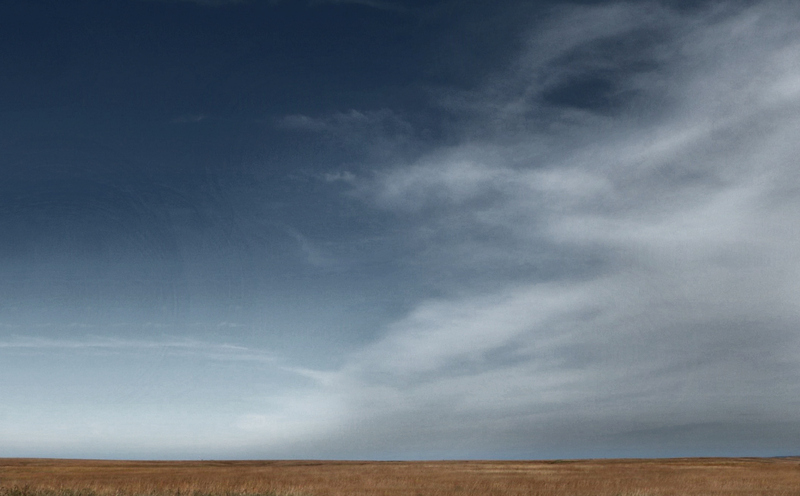 I love that picture… the expanse of land and the possibility just waiting to be heard. Thanks, Tamara. I love a good horizon, too, whether on land or on sea. There’s something about being able to look out and out and out that just makes me happy. It is a different landscape. Whenever I see images of England, I’m often struck by the small fields, the hedgerows, and such. When I was in England, the countryside felt comfortable — sometimes almost cozy. Out of the prairie and plains, it’s easy to feel either exposed or enticed. My dream is to ride horseback across the tallgrass prairie. We’lll have to see about that. If you or I were Rick, we’d just hop on our bicycle and hope for no snow in the mountain passes. But neither of us is him, so my recommendation is the lovely gizmo called an automobile. Can you imagine what Louis and Clark would think of our cup holders and sound systems?